McHappy Day brought together hundreds of volunteers from dozens of businesses, charities and associations on Wednesday, May 3rd. On that day $1 from each Happy Meal, Big Mac and McCafé beverage was earmarked for Huron House Boys’ Home, and generous patrons donated in exchange for McHappy Socks, pins, scarves, and old fashioned goodwill. McDonald’s also raised money prior to the event by collecting donations and displaying Ronald McDonald feet with the names of donors at several locations in addition to their restaurants. Thanks to all who participated in this amazing community building event, contributing to a $25,000 donation to Huron House Boys’ Home. McDonalds holds this day annually in support of a local charity, in addition to their ongoing contributions to Ronald McDonalds’ Houses across Canada. Read more at Lambton Shield Wednesday’s McHappy Day Benefits Huron House Boys’ Home and the Observer McHappy Day was a McSuccess. Libro supports opportunities for adding value to the community with their Prosperity Fund. They value things like regional economic development, building financial knowledge and youth leadership. The Huron House Boys’ Home Christmas Tree Project has just the kind of potential they support, and we were delighted to learn they chose us as one of the 2016 recipients. The Christmas Tree Project, with the start-up fully funded by Libro, will enable Huron House youth to collaborate on a business plan and manage (with supervision of course) the business on a long-term basis. Boys will learn about farming and about themselves as the project is integrated into Boys’ Home programming. The project will provide boys with opportunities to develop beneficial skills and behaviours as they manage the business and the farm, and interact with the community. But don’t expect to be buying Boys’ Home Christmas trees just yet… it takes several years before the trees are large enough to sell. 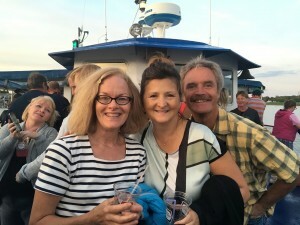 On a perfect end-of-summer evening, guests enjoyed a lovely cruise. Boys’ Home supporters were all smiles as they enjoyed the weather, the scenery and the classic rock tunes of Dawg House. Quiet moments, lively dancing, and lots of laughter were all to be found and enjoyed. Proceeds benefit the youth of Huron House. See more photos on Flickr. Twenty-five people from three organizations came together for a work party at Huron House. The t-shirt and the smiles said it well: “giving back, it works”. Working together, sharing camaraderie and paint brushes, and breaking bread together was part of the experience. Thanks to Libro Credit Union, CF Industries and Eneos Sytrolutions, and to all who came and cared. It’s amazing how much better we look with a fresh coat of paint, and it was a joy to see teams of people living and giving the values we strive to instill here. See more photos on Flickr. Boys’ Home run celebrates 30 years. The Father’s Day Run/Walk/Skate/Bike for Huron House Boys Home is celebrating its 30th birthday this year. “I think there is something about pulling the heartstrings with a Father’s Day Run for a Boys Home. It’s emotional. The community really supports Huron House Boys Home in a big way,” says Don Adam, Huron House executive director. The Boys Home Run has become a family tradition for many people. Over the years, the Boys Home Run has grown to include a 10k run, a 5k run, a 7k rollerblade, a 7k bike ride and a 5k walk. This year, 20k and 40k bike rides have been added. “We are hoping to draw other types of participants with other interests. Not everyone is a runner. This is something different,” says Adam. Routes begin and end at Mike Weir Park. In addition to the run, there is a sausage and pancake breakfast for all participants. But, you don’t have to be a participant to attend that event. The cost for non-participants is $5 for the breakfast. The breakfast takes place on the day of the run, Sunday, June 19, 8:30 a.m. to 10:30 a.m. at Mike Weir Park. All proceeds from the event stay in Sarnia/Lambton and support Huron House Boys Home. Last year’s event raised $18,000 and Adam is hoping for $30,000 this year. As of this interview, 75 people were registered to take part. Adam is hoping for many more. Many local businesses have donated prizes for the event. All participants in the event are entered in the draws for the prizes, but must be present to win. The top prize is a $250 Via Rail voucher, available for participants who raise $150 or more. The participant’s name will be entered once for each $150 raised. Participants in the event are encouraged to help solve the Clue Game. They are given a few clues and must come up with the answer. The 10 boys who are currently living at Huron House, along with 150 other volunteers, will be helping with the set up and take down of the event. Some of the boys even take part in the event as participants. “We try and engage the youth in all of our events,” says Adam. The Ministry of Children and Youth Services licenses Huron House Boys Home annually. Approximately 30 per cent of their budget comes from the ministry. Funding is also received through fee for service (Children’s Aid Society). Parents are expected to finance medical costs and provide clothes. Funding also comes through individual donations, corporate sponsors and donors and fundraising. Huron House has several other fundraising activities that take place throughout the year. A pancake breakfast in April raised $1,191.15. Other upcoming events include Race to Erase on Sept. 24, Duc d’Orleans Cruise on Sept 15 and a Quarter Auction in November. Other major fundraising activities include Men Who Cook in February, the spring bulletin (newsletter) and the annual Christmas Appeal. The Father’s Day Run/Walk/Skate/Bike takes place on Sunday, June 19 at Mike Weir Park. Register online, by mail or in person. For more information, visit hhbh.ca, visit the home at 2473 Lakeshore Rd. in Bright’s Grove or call Sharon at 519-869-4000. Last minute registration is accepted in person outside SportCheck in Lambton Mall on Friday, June 17, 5 – 9 pm and Saturday, June 18 10 am – 5 pm. If you can’t run, you can also pledge a runner by calling the office or visiting the website.